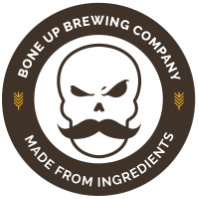 Stats: Wasted Life - Bone Up Brewing Co.
Color: a hazy deep gold, bolstered by the slightest touch of burnished copper; it's a color that evokes memories of the most exquisite cream sodas. Cheese Pairing: Humboldt Fog or Délice de Bourgogne. Food Pairing: Jamón serrano, extra sharp cheddar, and a big hunk of crusty bread. Good night. Music Pairing (Jimbo's Choice): "Bruce Lee" by Indian Handcrafts. Music Pairing (Jared's Choice): "It's Raining Men" by The Weather Girls or "The Brews" by NOFX. Best Occasion to Drink: As your first beer on Thursday evening, when the week is almost over and you just want to wind down. Then - hopefully - throughout the rest of the weekend, spurred by fond recollections of how good it tasted on Thursday. ​Ever had an IPA? This one is better! And it gets better with every glass you have, so you should probably drink this to the exclusion of everything else. Except water. Water is good for you. And maybe coffee too, but that’s it. There's not much new to say about IPAs since there are five thousand or so other commercial examples out there, but it is a style that's a personal favorite of ours - we tend to prefer hops with the big, fruity, juicy flavors that are all the rage with the young'uns these days. But since this is our mainstay year-round IPA (don't worry, hopheads, we'll have plenty more variations on the style once we're rolling) we've tried to balance that out a bit (for everyday drinkin' we tend to prefer something that doesn't necessarily smell like a fruit salad with perfume on it) with some malty goodness and a dab or two of some slightly-more-nuanced hop varieties (don't get me wrong, we're all about intense flavor. But you wouldn't want an all-syrup Squishee every day, would you?). Needless to say, this is one you'll miss in between pours.